Jim Mahoney joined Blake in 2006 as a grade dean, and served in that role for ten years, acting as the lead advocate and administrator for 130 students during their four years of high school. He made the transition to college counseling in 2014, and leads the office's efforts in supporting recruited student-athletes, among other duties. 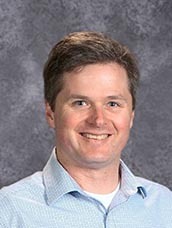 As a member of the English department, he has taught AP English, Creative Writing, and Comedy, and currently teaches the senior elective The Literary Essay. Before joining Blake, Mr. Mahoney served as senior associate director of admissions, humanities teacher, and head squash and tennis coach at St. Paul's School in Concord, NH, and was previously an independent school faculty recruitment consultant at Carney, Sandoe and Associates. He is married with three children, two of whom graduated from Blake. A New Hampshire native and graduate of Dartmouth College, Mr. Mahoney maintains strong loyalty to New England sports teams, culture and cuisine.